Before we begin, I need to make one thing absolutely clear: as Napoleon Bonaparte said, "History is a set of lies agreed upon". If you keep this firmly in mind, you can approach the "History" of 'Martial Arts' (this term, in and of itself is a lie, as today's so called 'Martial Arts' are nothing of the sort). We can be sure that, from the beginning, man has been attacking each other. For whatever reasons, some have always taken advantage of the weaker. Thus, to use the modern terms, mankind split up into three groups: the wolves (operating either alone or in packs); the sheep (not comprehending the need to defend themselves): and the sheepdogs (dedicated to defense of the sheep and themselves). Defensive strategies and tactics have evolved over time. Technology and past experience dictating these changes. Unsuccessful ideas died with their originators; though they were destined to reappear over and over, as the memories of their abject failure receded from memory. Successful ones were incorporated, repeated, modified, and adapted to the current situations involving the participants. This has been the history of mankind all the way to 'Modern' times (just imagine how 'modern' we will appear two hundred years from now!). 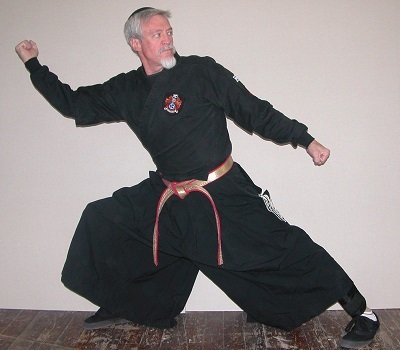 The system, Ryukyu Kenpo Kobujutsu, is my system. It is the expression (and culmination) of my studies in the world of human combat and that which I wish to hand down to others. It is not, nor could it possibly be, all inclusive, or perfect. No one system can be, with our current technology or life spans. I am merely a link in a long chain of people, handing down what knowledge they had gained and desired to pass on. I am the product of a strict military upbringing and training. As such, life and death are realities that I have been up close and personal with in combat. They govern much of how I think and what I do. I have learned much from many people; friends, acquaintances, and enemies. A few stand out, however. Kyo Sung Chou, taught me Tang Soo Do, Soo Bahk Do, Moo Duk Kwan on Yeouido Island in Yeongdeungpo-gu, Seoul Korea. This system taught the kata similar to Karate-do, self-defense taught was Hapkido due to a lack of sophisticated defense in the Japanese Karate-do, kumite was every class, with contact ranging from 'light' (meaning bruising) to extremely violent bloody matches ("Don't let that chakusaa meegook beat you!"). It was oriented towards high powerful kicking maneuvers; and emphasized aerial along with complicated combinations of power kicks. Some of these kicks became part of our current system. No one has ever heard of Mike Shelton; yet he, single-handedly, forced me to perfect my technique and overcome my sloppy habits. He elevated my understanding of what I was doing and how to correct it. He created my drive to perfect the movements and understanding of how they worked. He taught me the value of writing down in a notebook everything I had learned in class. He, also, taught me a ton of techniques and kata, and, how to classify and order them. Ten years of training and experience prepared me for the ultimate influence in my training. Seiyu Oyata brought his Ryukyu Kempo (as spelled by his American students) to Merriam, Kansas. It was the name he gave to what he was teaching. The twelve kata were from Shigeru Nakamura and his Okinawan Kenpo. The self-defense techniques were his interpretation of Seikichi Uehara's Motobu Ryu. The weapons kata were from Master Nakamura and (supposedly) Uhugushuku no Tanmei. Another ten years of constant, almost daily training with him ended with my relocation to the middle east. Slowly absorbing the lessons and principles he, the military, and many others taught me, I created the system that I teach today.